As soon as Fort Lee was abandoned, Washington began to withdraw his army across New Jersey toward Philadelphia. About 5,000 Americans left Hackensack on November 21, 1776, and retired without casualties 100 miles to safety behind the Delaware River on December 7. But the troops suffered a want of clothing and a sense of defeat which quickly translated into high sickness and desertion rates. It was a demoralized army that unraveled in retreat. Even their stoic commander despaired over "a noble cause lost," and wrote to his brother, "I think the game is pretty near up. At about eight o'clock on the morning of December 26, 1776, American troops surprised a Hessian picket guard, stationed in houses along the Pennington road about a half mile outside Trenton. Despite a disorganized show of resistance, the Germans were quickly captured or dispersed. Almost simultaneously, General Sullivan's troops approached the town of Trenton, announcing their arrival by the boom of artillery. As the confused Hessian garrison rushed about in a great commotion, Washington advanced his troops to the junction of King and Queen Streets, where Captain Forrest placed six cannon in a commanding position, his line of fire sweeping down both thoroughfares. Several battalions rushed across the field to take control of the Princeton road, preventing escape by that route. Contingents from General Sullivan's division drove General Wilhelm von Knyphausen's troops through the town and seized the bridge on the Bordentown road. Just as the Hessian artillerists prepared to fire two cannons, they were rushed and captured by troops led by Captain William Washington and Lieutenant James Monroe. Colonel Rall, roused from a heavy sleep, appeared upon his horse, trying to rally his troops. Instead, the Hessians fled into an orchard where Rall, shot from his horse, tumbled to the ground. St. Mary's Cathedral and its rectory, standing at the end of Warren Street, mark the former sites of the Green Tree Tavern, where Colonel Johann Gottlieb Rall ate Christmas dinner, and of his headquarters at Stacy Potts' dwelling, where he died of his wounds. While playing cards at the residence of Abraham Hunt, a Tory farmer passed him a note of warning. It was found, crumpled but unread, in his waist coat pocket the following morning. He was buried in an unmarked grave within the bounds of the graveyard of the First Presbyterian Church on State Street. Five Hessian officers and six enlisted soldiers were killed; another eighty of the enemy were wounded. Nine hundred and eighteen prisoners, six brass cannons, forty horses, one thousand stands of arms and fifteen colors were captured. The Continental army had four men wounded in the fight. Neshanic Creek, a tributary of the South Branch of the Raritan, drains the easterly part of a wide valley at the eastern foot of Sourland Mountain. Where this valley passes the Delaware River between Titusville and Trenton, the river's trench is shallow and consequently, the banks of the Delaware in this neighborhood, "although steep, are never vertical, as in the case where the bluffs are higher." Capitalizing upon the natural advantages of the site, McKonkey's Ferry operated here during the Revolution and it was here, despite the impediment of ice floes, that Washington crossed his troops and artillery on Christmas night, 1776, for the surprise attack against three Hessian regiments and a troop of British Light-Horse quartered in Trenton. McKonkey's Ferry was situated where Jacob's Creek, rising by several branches on Smith's Mountain to the north of Pennington, pours into the Delaware River. After the abandonment of Fort Lee in the face of a British invasion on November 20, 1776, the Continental troops under command of General Washington had retreated across the Jerseys to the edge of Pennsylvania, passing over the Delaware River on December 8th. In an audacious maneuver, designed to reverse the fortunes of war and restore American morale, Washington determined to attack the three Hessian battalions stationed at Trenton, a force of about 1,200 soldiers under command of Commandant Colonel Johann Rall. The boldness of Washington's plan of attack lay partly in its timing: the Continental troops would approach Trenton in the wee hours of December 26th. Colonel John Fitzgerald, one of Washington's aides, noted how the Hessians were vulnerable on one particular account: "They make a great deal of Christmas in Germany, and no doubt the Hessians will drink a great deal of beer and have a dance tonight." 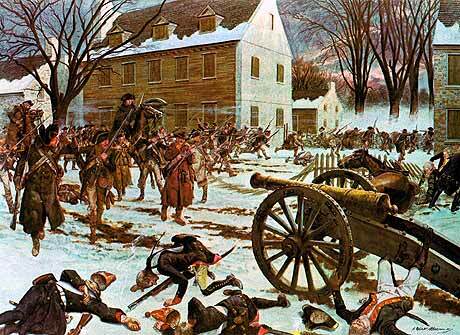 At six o'clock on Christmas evening, the troops marched toward McKonkey's Ferry, nine miles north of Trenton. Many of the ill-clad soldiers wrapped rags around their feet; others were shoeless. Boats collected at this strategic crossing were manned by Colonel John Glover's Fourteenth Regiment of Continental Line, a unit largely composed of fishermen from Marblehead, Massachusetts. The passage of 2,700 American soldiers commenced at twilight, but was impeded by snow fall that turned to sleet and by heavy ice floes in the river. Washington, wrapped in his cloak, watched silently from the shore. The artillery finally landed on the Jersey bank of the Delaware at about three o'clock in the morning of December 26, 1776, and the march got underway an hour later. Two miles beyond the landing, at Bear's Tavern, Washington separated his army into two columns: General Greene a division of about 1,200 men and ten fieldpieces, accompanied by General Washington, down the Pennington Road while General Sullivan's division of about 1,500 men marched down the River Road. Informed along the march by courier that the storm was making muskets unfit for firing, Washington responded: "Tell General Sullivan to use the bayonet. I am resolved to take Trenton."